A Philadelphia favorite, Steve’s Prince of Steaks opened its fifth spot this weekend, with a liquor license, full dining room and a menu that includes pizza. The family-owned Steve’s Prince of Steaks, founded in 1980 by Steve Iliescu, on Friday, Oct. 19, had a grand opening for its fifth location, in Hamilton Court at 3836 Chestnut St. in University City. The restaurants opening is significant not only because it’s the fifth Steve’s location in almost 40 years in operation, but it will be the only Steve’s location with a full dining room with table seating, a liquor license and an expanded menu that features pizza and wings. 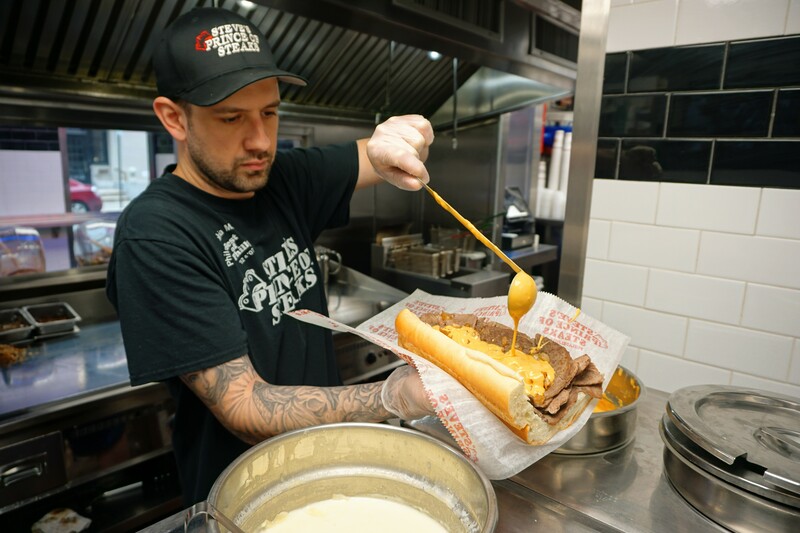 The first Steve’s Prince of Steaks was founded in 1980 at Iliescu’s Bustleton Avenue location, and its since expanded to three additional locations that include a Center City location and a location in Langhorne in Bucks County. The University City location will have counter high-top seating for up to 10 people and additional table seats for over 20 people. There will also be outdoor seating, with tables and chairs for up to 15 people. The drink menu will include beer, cider, cocktails, spirits and frozen drinks. All are available as a dine-in option, and beer will be available for takeout. We were able to sample the food and beverages at an “open house” on Thursday evening, that felt more like a party for close family and friends than a media event. The stand out of course for me was the cheesesteak, American with, but the sweet and spicy wings were a surprise treat as well. Pizza was not cooked to my liking, a little doughy in the middle, but perhaps that’s because they were flying off the counter as quickly as they we’re being put out. Beer was the drink of choice, and most were throwing back Coronas and miller lites to wash down their fries, wings, pizza slices, and steaks. You could feel the families excitement, and it’s not hard to see why this family affair has been so successful. They take great pride in their product, and truly seem to love what they do. When you go, get an American or whiz wit, goes great with an ice cold beer! Monday through Wednesday, 10 a.m. to midnightThursday through Saturday, 10 a.m. to 3 a.m.Sunday, 10 a.m. to 11 p.m.